While working on a rabbit sculpture for my daughter, I did a little research on rabbits and the moon. 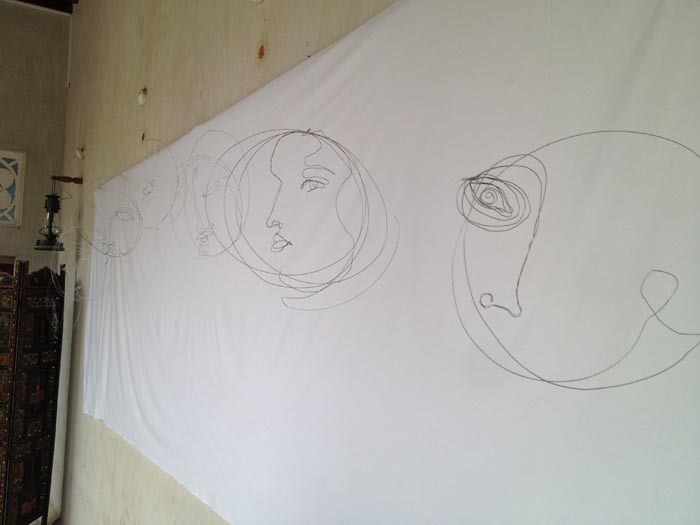 I was reminded of an exhibit we attended in Dubai at the XVA Gallery. 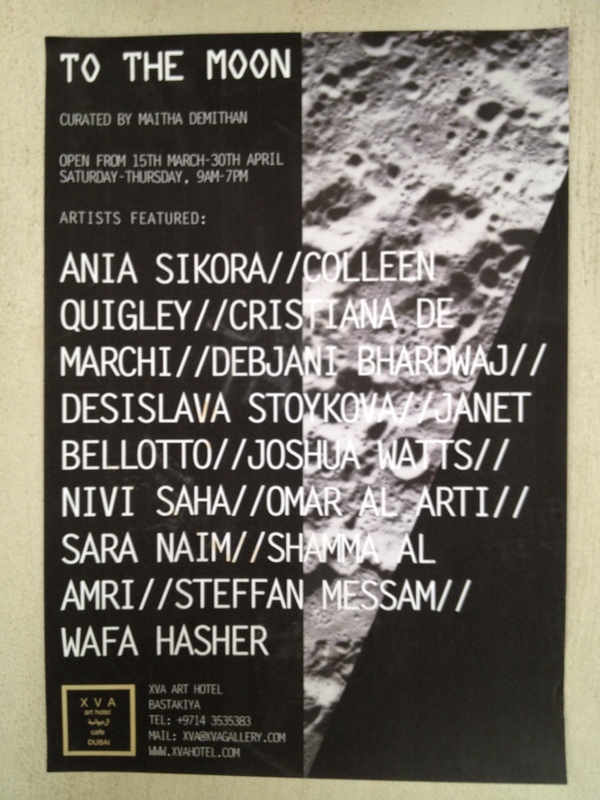 Featuring fifteen artists, the exhibit TO THE MOON explores our relationship with the moon in oil and ink paintings, digital prints, metal and ceramic sculptures. Our closest celestial body, the Moon’s twenty-eight day cycle of disappearance then reappearing holds deep archetypal meaning in all religions and traditions. Twenty-eight was the number of days Buddha meditated under a fig tree. Indian Brahmans teach there are twenty-eight angelical states above the human condition. In Islam the moon is a sign of Allah’s power and its twenty-eight day cycle is the calendar for all canonical activities. Associated with the unconscious, water, dreams and the imagination, the moon is feminine and denotes fertility. The goddesses Isis, Ishtar, Artemis, Diana, Heng-ugo, Ixchel and Hecate were associated with the moon in ancient myths, legends, folklore and poetry. What I find amazing is that globally rabbits or hares are associated with the moon. Aztecs (Central Mexico) believed the moon was the daughter of the rain-god Tlaloc. The moon was depicted as “crescent-shaped water receptacle with a rabbit silhouette”. Osiris (Ancient Egypt) was in the shape of a hare before being torn to pieces and thrown into the Nile to ensure the seasonal cycle of renewal. The Chinese jade rabbit pounds the medicine of immortality in a mortar under a fig-tree. The goddesses Ostara (Anglo-Saxon), Eostre (Celtic), Freya (Norse) and Kaltes (Siberia) either rode rabbits or had them as their companions. The Algonquin, Ojibwa and Sioux Winebago Indians’ (North America) mythic ancestor Menebuch, the Great Hare, came to earth to teach humans the skills they have today. After the Great Flood, Menebuch left the earth anew and went away. The TO THE MOON exhibit proves the adage that everything old is new again and speaks to the moon’s influence on the collective human psyche. The exhibit might still be hanging although a new exhibit TOY STORY was to begin April 19th. During my research, I discovered the Endicott Studio. Writer, artist and founder Terry Windling wrote an article on The Symbolism of Rabbits and Hares. I also relied heavily on one of my other favorite resources, The Dictionary of Symbols. 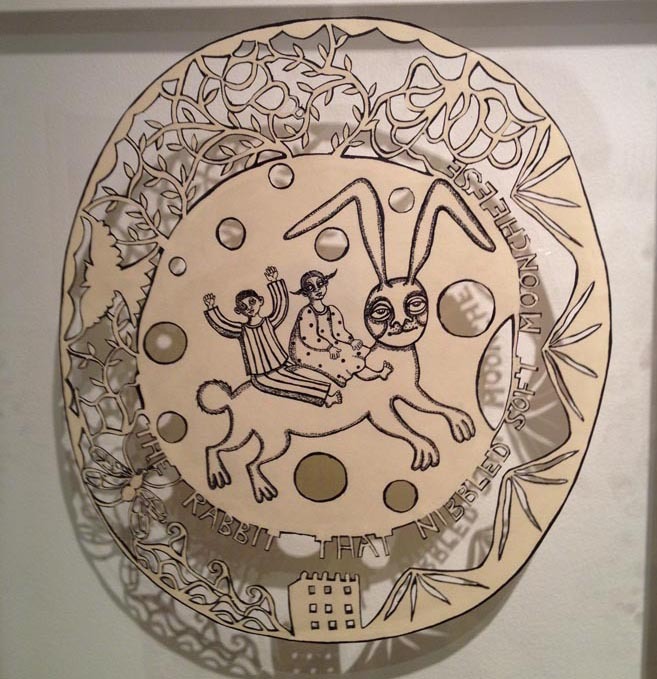 I also took note of the sculpture by Debjani Bhardwaj – The Rabbit that Nibbled Soft Moon Cheese – because from Europe there is the notion that the moon is made of cheese and in Japan the image that one sees when looking at the full moon is one of a rabbit making rice cakes (the side-silhouette of a rabbit on the right, facing left, with a mallet raised to pound rice in a barrel). An interesting juxtaposition of cultural legends I thought. I did not know about the other connections of Moon and Rabbits… thank you. The night of the Dark Moon is called the Hare Moon because the darkness makes it the best night for rabbits to feed without being eaten themselves. 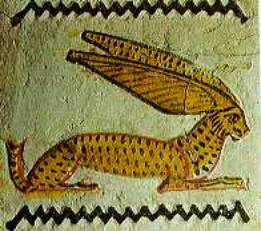 Also, the Hare was the original symbol of the sign Virgo.